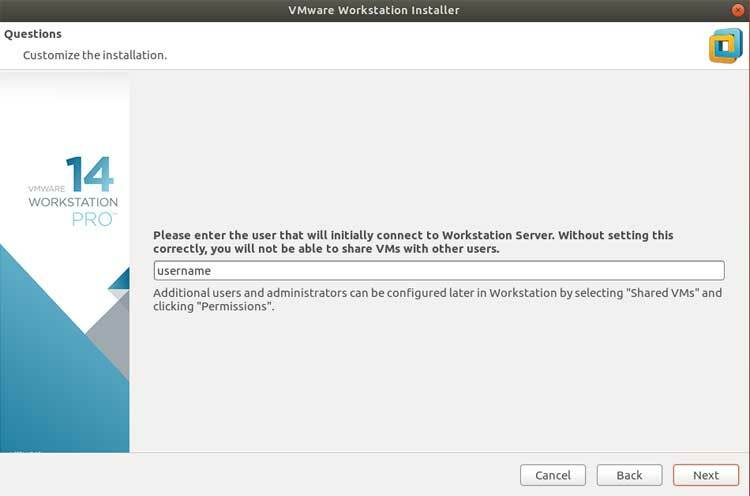 This tutorial explains how to install VMware Workstation on Ubuntu 18.04 LTS. VMware Workstation Pro is a fully featured hypervisor that allows you to create virtual machines on your Ubuntu 18.04 desktop. Workstation 14 is the latest version and provides a very powerful environment for creating and managing virtual machines on your Ubuntu desktop. 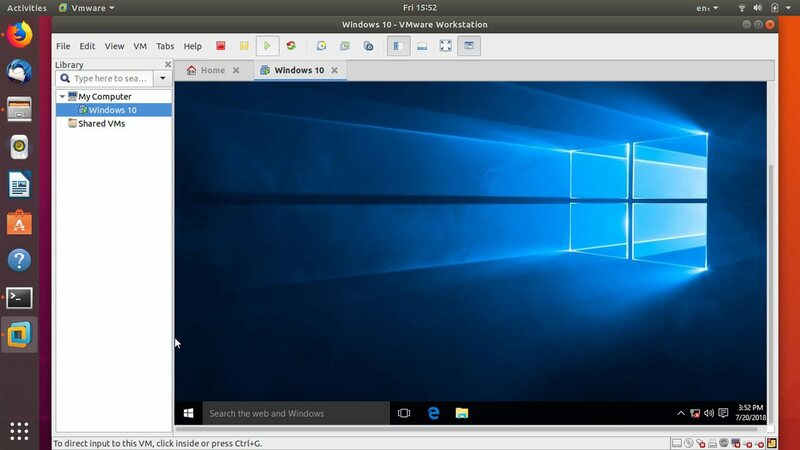 Download VMware Workstation for Ubuntu 18.04. Run the VMware bundle Installer. Download VMware Workstation - Go to VMware Workstation Pro download page and download the Linux installer. The installer comes with ".bundle" extension. You should save the file onto your hard drive. You should replace the file name with your own. After that you will get the VMware Workstation installer in Graphical user interface. 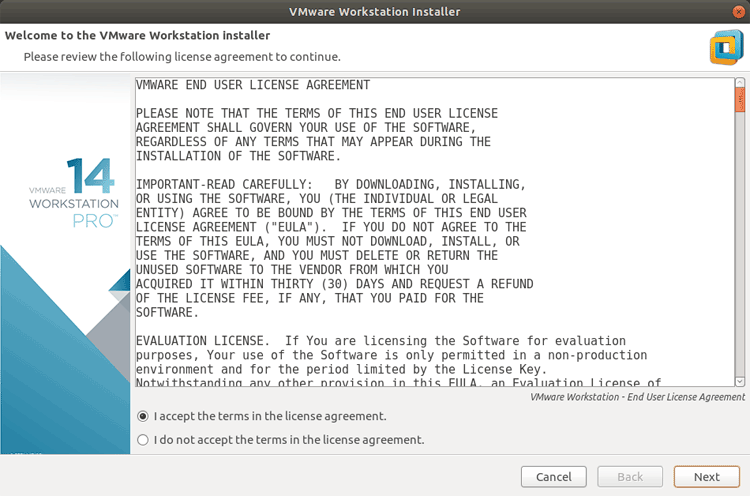 First accept the license agreement and continue with the default options. The setup wizard will ask for the username of the user that initially connect Workstation Server. The answer should be the username of your Linux user account. When asked for the license key, leave it black and click next (You can enter the license key, if you have a one. Otherwise, leave it blank). At the end of the setup wizard, Click on the install button to install VMware Workstation on Ubuntu 18.04. Once the installation process is complete, Go to Ubuntu application menu and open the VMware Workstation for the first time. You can use VMware Workstation on Ubuntu for free for 30 days, After that you will have to buy a license key if you want to continue the product. The VMware package also includes VMware Player which is a free product that allows to create virtual machines, but the VMware Player lacks the advanced features of a good hypervisor. So if you don't want to buy a VMware Workstation license, then use the Oracle VM VirtualBox which is completely open source and a free hypervisor that have all advanced features you need.